In a space where the mobile gaming market is expanding faster than any other and Esports are becoming more and more recognized as a competitive platform, major sports leagues and associations like the NBA, NFL, NASCAR, MLS and F1 have all begun executing and deploying Esports ventures. Solidifying their position in this industry, Millennial Esports has recently acquired France-based Eden Games and their mobile racing game, Gear.Club. An immersive car racing game, Gear.Club was released in 2016, rapidly growing its user base to 7.6 million with a marketing spend of close to zero. Extending its gaming experience on Gear.Club, Millennial Esports partnered with Amazon for the launch of its cross-platform competitive gaming service, GameOn. Gear.Club is one of the first games to integrate the new service. “By being an early adopter of Amazon’s cross-platform, competitive gaming service, we are excited to provide our fans with a superior competitive mobile racing experience combined with the thrill of prizing. Consequently, we expect to see greater Gear.Club user engagement, resulting in more downloads and in-game spending,” said Igelman. Millennial has entered into a number of strategic partnerships to help drive the success of their multiple verticals. These include agreements with McLaren Formula 1 in a partnership for the World’s Fastest Gamer tournament, IndyCar for access to real-world experience, Apple Music and AT&T to help drive downloads and retention, a casino hotel where live events can be hosted and the Indianapolis Motor Speedway for access to intellectual property. These relationships are all aimed at helping to increase further participation in Gear.Club and enhancing player experience and, subsequently, participation. Millennial Esports is led by a management team with significant industry experience in the entertainment, sports and technology industries. This includes Chairman Ronald Spoehel, who served as the Presidentially-appointed Senate-confirmed Chief Financial Officer of the US National Aeronautical and Space Administration (NASA), and CEO Alex Igelman, who brings more than 25 years of experience in technology, entertainment and casino gaming. This experience attracts substantial relationships and insights all aimed at developing the company and its presence in the Esports environment. Significantly invested in the company, management is supported by Global Blockchain, which recently contributed $2 million. In January 2018, Millennial Esports acquired an 82.5 percent interest in Eden Games, a French game development company focused on designing and deploying car racing games like V-Rally and Need For Speed: Porsche. By completing this form, you are giving consent to receive communication from Millennial eSports Corp. using the contact information you provide. And remember you can unsubscribe at any time. Most recently, Eden Games launched a mobile game, Gear.Club, in late 2016. The game is designed to immerse users into the authentic world of cars, providing fully simulated engines, powertrains, suspensions and aerodynamics. Car racing is one of the only games in which players use similar tactics and approaches as professional drivers, and Gear.Club allows for an immersive experience both in driving and strategizing. The game also offers players significant variety with regards to driver settings, vehicle customization and access to luxury vehicles. Players are also given the chance to build their own performance shop, giving them a taste of what lies ‘behind-the-scenes’ in car racing. Following its release, Gear.Club has been downloaded 7.6 million times, having crossed the 1 million threshold within the first five days. Accessible on both the App Store and Google Play, the game was particularly successful in the US, UK, Germany, France, Russia, Italy, Spain, Brazil, India and Canada. Most recently, Eden Games has worked towards expanding Gear.Club’s capabilities by being the first realistic racing game to integrate Amazon’s GameOn set of flexible APIs that incorporate real-world prizing into competitions. Using GameOn, Gear.Club will deliver daily competitions, detailed leaderboards and real-world prizes that continue to draw in additional players. It will also enhance its existing tournament models, leading to the delivery of its World’s Fastest Gamer competition, produced in partnership with McLaren. Looking to enhance user engagement and retention, Millennial is working towards implementing cash incentives in the game, including daily prize pools from tournaments. Entry into these daily competitions will be worth a small fee in the game’s currency—which is purchased in-app with real money or earned—and have the opportunity to win cash by earning the first, second or third position in the tournament. The company believes that mobile racing is a space ready for this type of cash-incentivized disruption and sees it as a tried and true revenue model. Another implementation that Millennial sees as the future for Gear.Club is their Global Series of Racing event. In this event, players will be engaged through online competitions and given the opportunity to win $1 million and drive an actual Indy Car by achieving the fastest race time. This initiative has already taken place once before in the history of the game, and will continue blurring the lines between the virtual and reality when it comes to car racing. 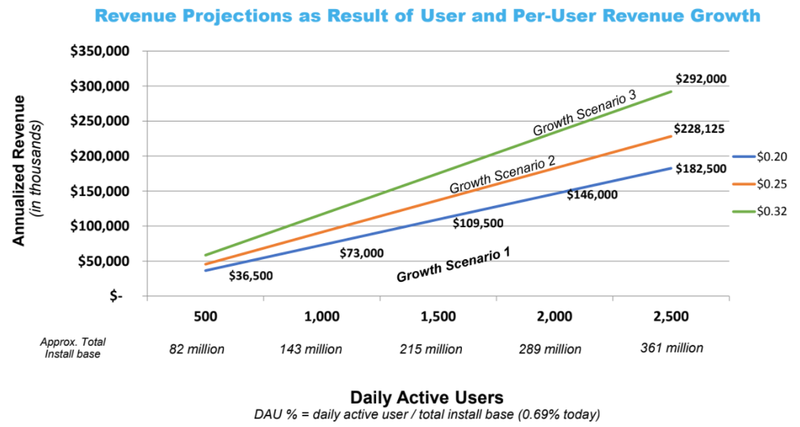 Annual revenue projections associated with the resulting user engagement and growth include at least $36.5 million with 500 daily active users, $109.5 million with 1,500 daily active users and $182.5 million with 2,500 daily active users. Disclaimer: Revenue projection is based on certain assumptions and is not to be taken as Revenue Guidance. Rather, it is based on potential DAU growth. Alex Igelman is a lawyer with more than 25 years of experience in technology, entertainment and casino gaming. Since 2013, he has been focused on the Esports sector and in 2014 came in as a consultant to Pro Gaming League (PGL), the predecessor company to Millennial Esports Corp. In late 2016, he was appointed as CEO of Millennial Esports Corp. and since that time has led the company in its successful growth. Over the last 25 years, H. Ronald Spoehel has served in executive management with multinational listed companies such as ManTech International, Harris Corporation, and ICF Kaiser International and on Boards of public and private companies in the US, the Americas, and Europe. He has also served as the Presidentially-appointed Senate-confirmed Chief Financial Officer of the US National Aeronautical and Space Administration (NASA). Prior to accepting the role of President at Millennial in 2017, Bob served as both the Chief Revenue Officer and Chief Marketing Officer for the St. Louis Rams for 12 seasons overseeing its growth from a $220M valuation to its current $3.5 billion valuation. Over the course of his long career, Bob has leveraged deep relationships across multiple verticals in transacting more than $4 billion in sports marketing rights agreements, including 10 naming rights deals and multiple television rights agreements. An accomplished senior executive with more than thirty years of financial and operations management experience, Mr. Shoemaker leads the worldwide financial operations and the finance team at Millennial Esports. Mr. Shoemaker previously raised more than US$600 million for the Ho Tram Strip development in Vietnam where he served as both CEO & Chairman of Asian Coast Dev. Ltd. With expertise primarily in the technology and hospitality industries, Shoemaker has built companies in the U.S., Canada, Europe and Asia, leading finance teams in global organizations with high growth profiles, scale, and operating complexity. Doug runs 2.0 Entertainment, a content production and co-financing company based at Sony Pictures Entertainment. He was an executive at Sony for nearly 27 years, most recently as President of SPE’s Motion Picture Group. In that role, Belgrad managed creative and business decision-making, and financial planning across all of SPE’s film labels. Prior to that, he spent 10 years as head of production at Columbia Pictures. Seth Schorr is Chief Executive Officer of Fifth Street Gaming and also serves as Chairman of Downtown Grand Hotel & Casino. Since early 2015 he has directed his organization to take a leadership position in the evolving gambling space becoming a pathfinder in integrating Esports in the casino experience. Currently his casino is the only one in the world to actively have Esports as a part of its regular promotional program. David Fawcett is the founder of Epic Capital Management and has 21 years of experience in Canadian capital markets, including 17 years managing money and several funds of differing strategies amassing an impressive track-record. Prior to founding Epic, he had worked for both Deutsche Bank Securities Inc. and the Brendan Woods institutional survey as a nationally-ranked analyst. He is also registered as an Advising Representative and Dealing Representative with the OSC. An engineer and executive, Adam Morrison has served as CTO for various technology companies, based in and around the Canadian tech hub of Waterloo, with focuses ranging from entertainment to event execution. He is also an avid gamer and has been a part of Pro Gaming League, Millennial Esports predecessor, since its launch. His skillset places him in a unique position to build technology that will be embraced by gamers. Currently the CMO and European MD of Millennial, Darren Cox is a motor industry innovator with over 20 years experience. His previous success with Nissan and Sony in delivering GT Academy paved the way for Esports within the racing game genre. IDEAS+CARS partnership with McLaren in the “World’s Fastest Gamer” and the Esports relationship with Silverstone Motor Racing Circuit, puts Millennial in the forefront of the racing world and Esports. *Disclaimer: The profile provides information which was sourced and approved by Millennial Esports in order to help investors learn more about the company. Millennial Esports is a client of the Investing News Network (INN). The company’s campaign fees pay for INN to create and update this profile page, to which links are placed on Investingnews.com and channel newsletters.